Don McKenzie is a retired physiotherapist with 40 years’ experience in running his own private practice, including 5 years serving in the public hospital sector. He was an elected member of the Waiheke Local Board. Having been a physiotherapist, Don is trained in the biological, behavioural, and rehabilitation sciences. As a result of his lived experience, he understands the personal and societal impact of disability and the benefits that accrue from inclusive community design and accommodating “can do” attitudes. Good design helps everyone! As a blind person himself, Don has for years been involved in raising the public awareness of people with disabilities, their needs and the contribution they can make given reasonable accommodation. 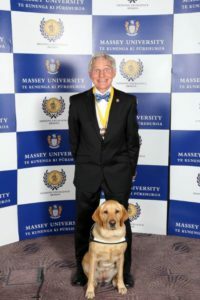 In recognition of his lifelong commitment to the field of disability, he gained entry into the TV1 Attitude Hall of Fame in 2010 and was awarded the Companion New Zealand Order of Merit in 2014. He received a Distinguished Alumni award, Massey University, 2014 and the Augusta award, Auckland Grammar Old Boys Association, 2017. “Thirty-eight years on statutory and not-for-profit boards in the health, disability and special education arenas has taught me that success comes with a sense of clear purpose, teamwork, the ability to listen, the right mix of service providers and users and an understanding of the facts”.